April 28, 2006 - Marvel: Ultimate Alliance sounds like an ambitious project to say the least. Featuring 140 Marvel characters (from the often quoted 5000+ roster of heroes and villains), 20 of which will be playable, Raven is taking their experience from the X-Men Legends action/RPG series and unleashing it in this multi-platform comic book fans dream. Gamers can expect Marvel: Ultimate Alliance on everything from the next gen consoles (Xbox 360 & PS3) to the current gen (PS2, GC, Xbox) and even the handhelds (DS & PSP) as well as the PC. No word on a Nintendo Wii port at this time. Spider-Man, Wolverine, Thing, Captain America, Thor, Elektra, Ghost Rider, Silver Surfer. and the vampire hunter Blade will be playable, but the 11 other characters remain under lock and key at the moment. From the screens we've seen the gameplay appears to be much along the lines of X-Men Legends, although I must say I prefer the visual design of Ultimate Alliance. Players will be able to utilize the various powers of their favorite heroes but right now we have no information on how exactly the RPG elements of the game will be implemented. The game also features offline and online cooperative modes, but we're currently unsure of how many players. We expect it will be 4 offline, but perhaps that number would increase online. 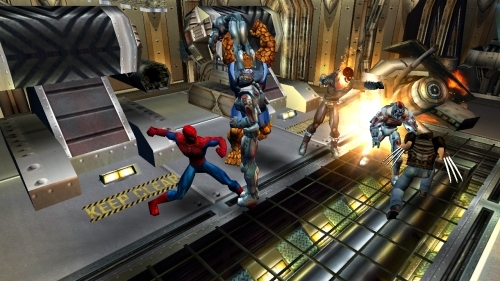 Marvel: Ultimate Alliance features a deep, rich gameplay experience by offering total team customization, where players create their own team name, icon and vehicle, as well as establish their team reputation as they play throughout the story. 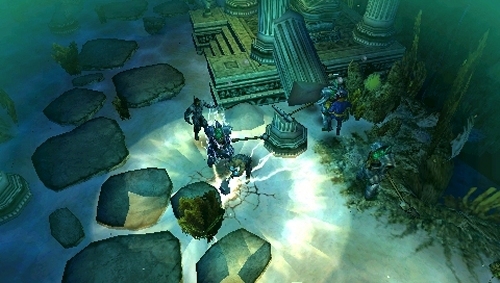 Gamers also have the option to level up each character individually to their liking, or all team members at the same time to keep their heroes balanced. With the games new combat system, players battle against the worlds most notorious Marvel Super Villains in the air, underwater, and on the ground, using grappling, blocking and dodging moves, by charging up their Super Hero powers before unleashing them, and using environmental objects as one and two-handed weapons. 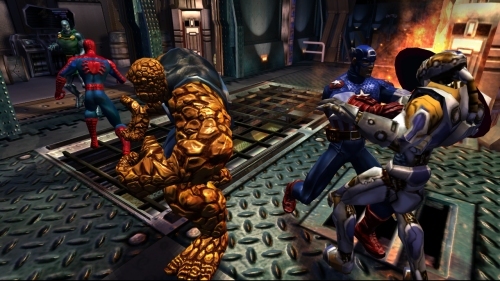 Marvel: Ultimate Alliance features a unique storyline where the missions players accept, the objectives they complete, and their interactions with other characters throughout the game directly impact how the story plays out. The game also features a robust multiplayer component where fans can band together with friends as their favorite Marvel Super Heroes, and fight evil in both on and offline cooperative story modes. Theres also a Competitive Mode where the game tracks various in-game stats so players can see how well they stack up against one another  affecting the amount of experience points earned and how equipment is distributed. Created by Raven Software and C.B. Cebulski, Marvel: Ultimate Alliance will be the first Super Hero game out for all next-gen gaming systems, and will also be available on current-gen, handheld and PC platforms. The game is currently rated RP (Rating Pending) by the ESRB and is planned to ship this fall.